Collecting credit card payments is hard for startups and small businesses on the web. You need to apply for a merchant account, make sure your servers are PCI compliant, implement credit card sanity checks, and write server side code to integrate with a service such as Authorize.Net. These things can take weeks and cause a lot of headaches. Your other option is to use a payment gateway such as PayPal or Google Checkout. The problem with those options is that they don't look very professional, and you don't have much control over the process. Stripe turned this very painful task of collecting credit card payments into a matter of copy & paste. You can now create professional-looking credit card payment forms in minutes. Using JotForm’s Stripe integration, you can create one-time payment forms, donation forms, and even recurring billing forms. 1. First, open your form in the Form Builder. Then, open the Payment Tools toolbox on the left side of the page and drag and drop Stripe to your form. 2. 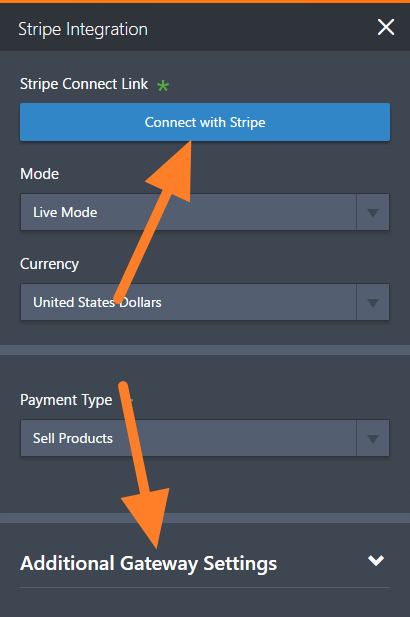 In the Integration wizard, click on Connect with Stripe. You can click on Additional Gateway Settings to further customize the integration. 3. Once you are connected, you can choose what you want to sell. Is this a service or a product? Is this going to be a single payment for a product or recurring payments for a subscription? Or are you going to collect donations? Do you want to Create a Customer after Submission or Charge Customer Immediately? You might want to choose the type of decimal separator. Do you want to let your user choose multiple products? 4. Next, enter your products. 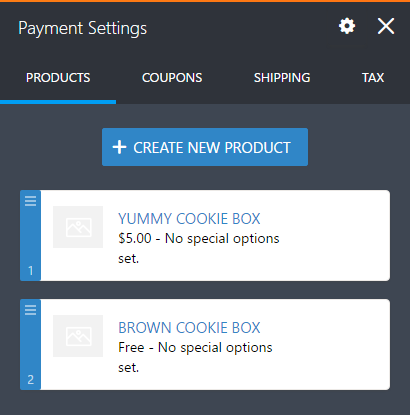 You have the option to create coupons, establish a shipping fee, or add tax. 5. You're all set. You can now test your form and start selling your products. Give it a try and let us know how it turns out in the comments below. Stripe’s rates are great: They charge 2.9 percent of your transaction fee plus 30 cents per transaction. There are no setup fees, no monthly fees, no card storage fees, no hidden costs: You only get charged when you earn money. Stripe is available in 32 countries, but they are working on providing their service in other countries as well. If Stripe is not available in your country yet, you can make a request for your country. Stripe is available in Australia too :-) We've been using it for yonkers! I can't get it to connect. I click where it says connect (as shown here) a secondary JotForm box pops up and I click on that to connect. It brings up another box that says it's connecting which eventually just flashes and disappears. Nothing ever changes. now PAY PAL is charges too much and prevent us on giving back. We are non profit. The three countries that are in our tournament is Canada, United States and Mexico. So, is Mexico coming up line soon with Strip? 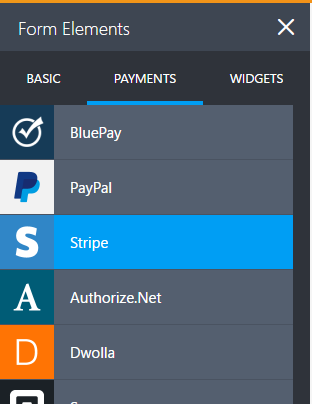 I would like to integrate stripe with one of my jotforms for photo ordering but when I look at the payment options available PayPal is the one available. I use stripe through other platforms so I know that it is available in Australia. I'm not sure why I can't select it as an option. Hi - now that Google Pay can be integrated with Stripe. Is there a way to add the stripe.js elements to allow a customer to choose to pay with Google Pay on the JotForm that integrates Stripe? Hi team, I have successfully integrated my form with stripe and everything looks great and processes properly. However, the products selected and the quantity aren't available nicely in the WebHook integration. Can you please advise how you would go about taking a payment through Stipe on a JotForm and then having the details of the purchase available through Zapier or other WebHook? How do I trigger an email to a consumer who has purchased a subscription after a trial period? How do I cancel a subscription before it begins? Please confirm that Stripe is now also available in Singapore. I see an option to change currency to SGD. How do I test out a subscription without actually getting charged? If that is not possible, how do I do a refund or cancel a subscription at any time? I made a sample form to try connecting with my Stripe account, but all I had to do is click in connect with Stripe and then shows that my account is connected, but how can you connect with my Stripe account without API keys? This is in response to the above request, as I am unable to reply to my initial question vie the automated email response or from the actual thread its self. And so I have no access to the wysiwyg editor.. I just keep getting taken back to my account rather than the View Answer part of the thread, and I have tried logging out and different browser etc.. So please forgive for just once again putting a screenshot link I really do not know what else to do. Sorry and I hope that this make sense. Have been on this for hours to jotform to integrate with Stripe. Just keeps getting as far the connection going round and round. Have cleared the cache, have tried on different browsers have tried on 3 separate Laptops. No joy at all, is their any fix at all for this. As I just found jotform for the very first time and it definitely offers a nice clean page, but just can not not get the necessary connection and hale looked all over the net for a fix. I have tried a lot and I mean a lot of different scenarios. I am based in the UK and have had my Stripe account for a while now but have never needed to use till now. I saw something about the US and Canada but did not read it and can not find it now, surely it is not that? Any ways support at this point would be great if at all possible. This still doesn't pass customers email addresses for receipts. Can you guys fix? How do I get my products from Stripe onto JotForm? Is there a way to integrate form input with strip form? for example if a user in option 1 selects the drop down of 3, then the strip payment data automatically updates their quinty to 3? does that make sense? Hi. Stripe is now available in NZ (in live beta) - but the issue I have is that your currency dropdown doesn't include NZD. Can you advise when that will be available please? The Stripe integration with Jotform is working and processing the transaction, but an ORDER is not being created within Stripe. Am I missing something? Is there any way to have the Jotform order process as an order within Stripe? 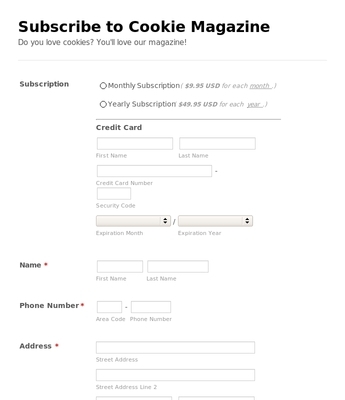 I am testing Stripe using the Subscribe to Cookie Magazine Form. I need to add sales tax only on subscription that originates in the state. For example, sales tax for those in NY. How do I do this? I do not see the option of adding the Stripe API key in Jotforms. Where do I find this? How do you run the wizard for configurations? Does the wizard automatically update the form? Or is that done manually? p.s. I have had to delete price on form even after it was deleted from Stripe. I am not sure why the wizard cannot update the form when a plan in Stripe has been deleted. I would really like a response. I would like to have our donation form give the user two options: one-time payment in any dollar amount or a monthly recurring payment. It looks like the Strips integration allows this but not both options on the same form. Can you tell me if it's possible to set up the form to have them both options without having separate forms? I did not see it in this thread, unless it was missed, but can you include QUANTITY requests with a STRIPE purchased product, in the event someone wants more than one of the product sold, and STRIPE through JotForm, will automatically populate the product price "times 2?" Can this be done? Thanks. Can I use different banks and bank account numbers in each of my forms. Example: Clover Kids Camp jotform funds from stripe to be deposited into Iowa State Bank Checking account #000-00-11 and then Pint Size Kids Camp jobform funds be deposited into Prairie State Bank Checking acct #000-00-22? Not a tech novice, so I hope this is not a silly question. But, is the JotForm, with the STRIPE integration for subscriptions, responsive, optimized for mobile devices? Also, when adding to the website, do all of the fill-in features appear, or can a customer click and have the JotForm open as a tool tip? 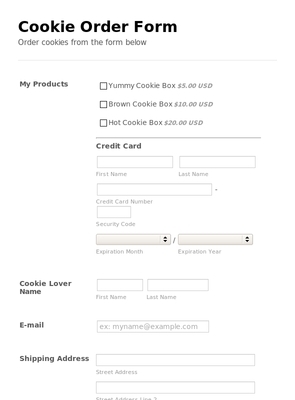 I setup a form ( love it btw great job ) but I have a few questions integrating stripe. I know stripe requires and https:// when using it on a website, but I assume it's using JotForms https:// in a form so is an SSL not required on my site when using Stripe w/ Jotform? No Taiwan support. Man this is never going to happen. Paypal only has donate buttons for inside USA. I'm an America for Christ sake. I can't find any info anywhere on how to switch Stripe from Test Mode to Live mode. When I do it on the Stripe side, nothing updates on the JotForm side. What if I want to have a blank field that the customer can fill in any amount such as for a donation? Is this possible? Am not clear with the steps on how to implement stipe on my website.Can I contact someone for a quick response? I have set this up where people are paying to upload 3 attachment images to my dropbox account. In sandbox mode, all looks good except that the attachments do not get sent to dropbox. Am I missing something? what about the secret token and all that?? do we still need to do that? or the money will be direclty transfered trough jotform?? I have my STRIPE account. I have tried to get a JotForm to work with STRIPE CONNECT and API keys from STRIPE: no luck at all in getting any of this to function, sadly, it did look too easy to be real. Yet I do see one of you has had success. is there anyway of changing the text were is says 'Credit card' to 'Credit or debit card'? This is a great tool but I have found when I add the set-up fee plus regular payment option I get an error. If I do not set that up and only have the monthly subscription fee there is no error. Thanks. I responded to that thread and see. What about stripe emailing the customers receipts? I noticed on the stripe account, customers can get email receipts. However, I noticed that JotForm did not include email address option along with billing address option in the stripe integration set up. When can we have this? Any work around in the mean time? Using your Stripe integration in forms, do I still need to insert "stripe.js" to my website? Greetings! ~ What are pros & cons of using Stripe Connect vs. entering the API keys manually? Does this require an ssl certificate on the page the form will be integrated into? Or https? Does this create customers in Stripe? Do I apply for the Stripe account for my various clients or does each client set up their own account and then send me their information to integrate it? I assume these Stipe Accounts will have confidential information such as the bank account to deposit into, so I guess it will be up to each client to set up their own account? I am a US resident currently establishing a business in Jamaica. I operate bank accounts in the US. Would STRIPE be available to me, with my IP address recorded as being in JAMAICA? How can I overcome this anomaly? Interested in this... can I find more specific info... and can we have the person tell us WHERE they want their donation to go, such as which fund, team member, etc.? How can I create a form with the option for one time payment as well as recurring payments? Group A pays X, Group B pays Y. How can I set that up?